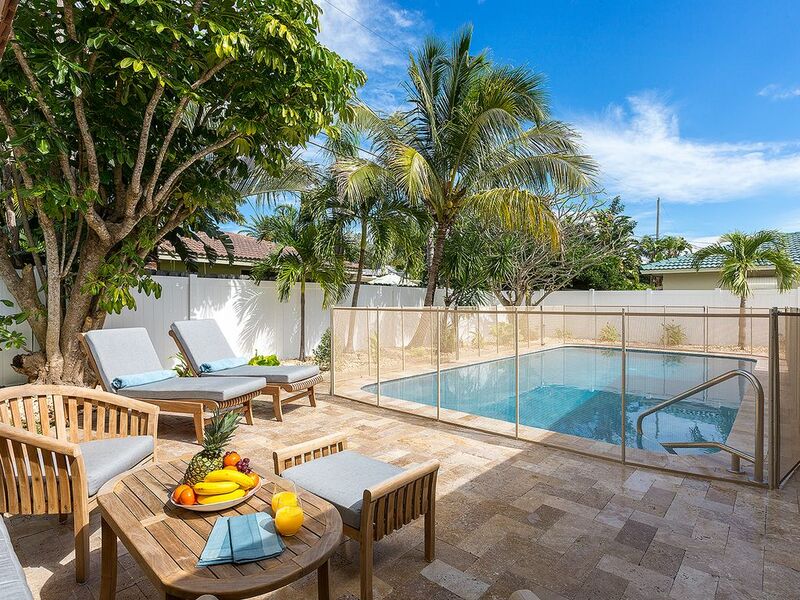 Lighthouse Point Family Retreat is a perfect South Florida vacation home away from home that offers a beautiful living space for up to 8, family or friends. This 2,485 sq ft showcase home is located in a gorgeous neighborhood of tranquil canals and tropical scenery, and is nearby countless local options for fun, sun & recreation. 4 bedrooms and 3 bathrooms are arranged to provide an appealing blend of maximum space and accessibility. The look is modern and bright, with lovely décor and beautiful porcelain tiles in the living room, dining room, and kitchen. Shared spaces are in an open plan that invites fun & friendly gatherings. A separate living room and family room each include a large flatscreen TV and comfy seating. The kitchen features a breakfast bar and stainless steel appliances with an adjoining dining area. Wireless Internet is included. A separate screened in “Florida Room” is perfect for alfresco dining: it includes plush seating, a large table, a BBQ island with an outdoor vent hood, and an integrated refrigerator to keep entertaining easy. The master bedroom includes a very large king-size bed and a master bath with a frameless glass shower and twin sinks. Additional bedrooms feature queen-size beds and two share a large bathroom. Families love the spacious and accommodating backyard! The centerpiece is the pool, fenced in for child safety and with a spacious deck that includes lounge chairs and a small bistro-style table & chairs. There is ample room to sunbathe, with lush palms and tropical foliage that creates a marvelously relaxing space. There's also a toddlers' playground with swings and a slide, and a grass area for the little ones to run around on. The property includes 4 performance beach cruisers, perfect for a leisurely spin through the neighborhood. The beach is just minutes away, where you can enjoy sand & surf or partake in aquatic adventures, including boat tours, fishing, kayaking, scuba & snorkeling, parasailing, and more. Lighthouse Point is home to 5 large parks where families can picnic or play and the city offers easy access to delightful locations for dining, bars & nightlife, shopping, and entertainment. My family and I were looking for a house with enough room to host 3 generativos to celebrate my granddaughters 2nd birthday. Not only did we find the right place, the house exceeded my expectations. From the location, cleanliness and beautiful decoration. it has everything a family would need. A place to spend with family as well as being close enough to enjoy the beach. The best part was to come back to the house and also spend time at the pool and playground area for the kids. We enjoyed our stayed and the house is truly a 5 star. The best vacation in years. Beautiful house, lots of space, nice heated pool and a great Florida room. The kids loved it, and so did we. Thanks a lot. We're already making plans for our return. This was a convenient and comfortable vacation rental for 4 adults and 2 children. It is in the same neighborhood as a relative's home which is why we chose it. Overall it was a decent rental, with a couple of problems that could have been fixed before we arrived. When we arrived, the AC condenser drain was plugged and 4 or 5 inches of water had accumulated in the air return shaft (it had been going on for a while for that much water to be there). Water was leaking from inside the house into the garage, and the AC eventually stopped working (both of which alerted us to the problem). The property manager did not return our 2 calls, so we called Runar, who got through to the property manager and an AC tech came at 10 pm and fixed the problem. With all the water leaking into the garage, this should have been noticed before we arrived. The pool was very full due to all of the rain, and was not skimming so it was quite dirty. We drained a little of the pool water to get it to the level where it would skim and used the pool vacuum from the shed to the clean the bottom. The next day, there was an error message saying the pool needed salt, so we called the property manager who sent the pool maintenance technician. It would have been better for the pool to have been checked the day before we arrived. The wooden pool furniture was broken and the padding was rain soaked, so none of it was usable. It should be replaced with weather proof furniture.The house furnishings are nice, but all of the mattresses are extremely firm. There were no washcloths provided with the towels as well as no facial tissues in the bathrooms (toilet tissue only). The vacuum didn't work at all so we were unable to clean the floors. The washer and dryer are very new and worked perfectly. Our favorite part of the house was the screened in Florida room with the huge table and grill, as well as the very nice pool. This is a nice rental property that we'd consider staying in again. Thank you for your feedback. It means a lot to our team as we work day and night to provide the best experience to all of our guests. As you know, ACs can be very unpredictable if doors are left open while the AC is running. It will create condense and can, therefore, create a lot of water and eventually a leak. I am really happy however that we got someone to assist you with the AC at 10PM at night. As for the pool, due to the heavy rains we had, it is difficult to keep it clean but we always assist with sending the pool company out in such situations. We again appreciate your feedback and have done a complete walkthrough of the home to ensure everything is perfect. Beautiful Home in a good Neighbourhood. Overall, our vacation rental experience was very favorable. The iRenta/SFR crew did their utmost to give us a great stay, we were all very happy with both them and the property.